An established distributor of indoor and outdoor accessibility solutions serving the Tri-State area of New York, New Jersey and Connecticut, DAY Elevator & Lift offers premium quality products from well-known manufacturers. 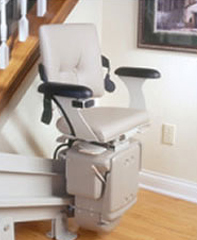 Our inventory of stair lift systems includes Bruno’s Electra-Ride LT stairlift. This straight rail stairlift is an ideal and affordable indoor accessibility option for homes. Electra-Ride LT comes with Bruno’s Gold Warranty of five years for major components and two years for the parts. With its vast industry experience, DAY Elevator & Lift is well aware of the requirements of home owners, builders, and architects and can assist with professional installation and maintenance services for all stair lift systems. We can help you find the right home stair lift after a thorough evaluation of your site and your specific accessibility requirements. Our 24-hour on-call service is a great boon for our customers and helps keep your equipment running safely and securely all the time. We offer timely inspection and maintenance service, and also perform or witness category 1 and 5 testing for stair lifts. To know more about the Electra-Ride LT Stairlift and the other Bruno home stair lifts we supply, please call (800) 758-5438 or write to sales@dayelevator.com.